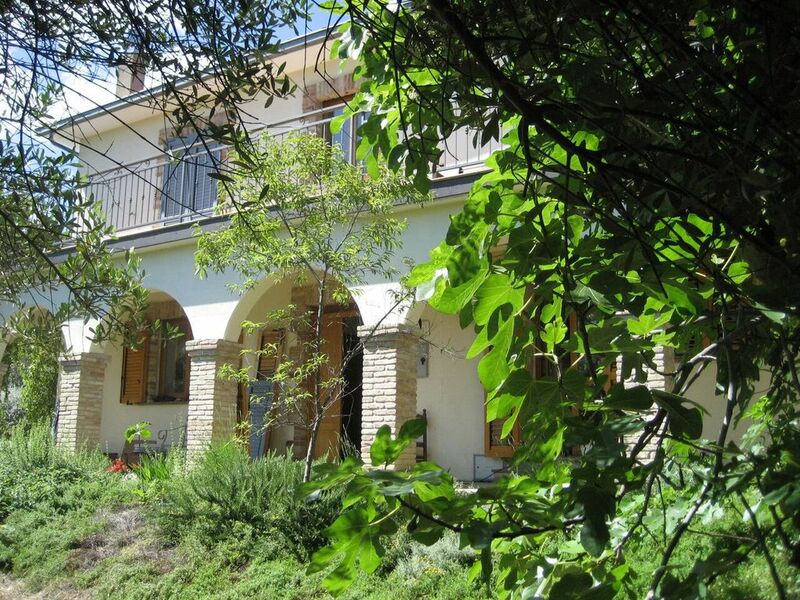 A beautiful renovated farmhouse on the edge of a large village in the foothills of the Maiella mountains. It provides the perfect holiday hideaway in a wooded landscape. At the end of a secluded lane, it has stunning panoramic views in 3 directions, of Lake Bomba, the mountains and the Sangro valley with the sea beyond. The house is surrounded on all sides by an old olive grove of over 1 acre, ensuring privacy. You can have a barbecue on the terrace overlooking your pool,which measures 9m x 4.5 m and nestles between the trees. Thick walls and wooden shutters protect the interior from temperature extremes. The interior has tiled floors and white walls. Most rooms have vaulted ceilings or wooden beams. Upstairs, enjoy a meal or a glass of wine on the large balcony while taking in the view. You can pick figs when in season. Structure to the house: During renovation, considerable structural improvements were made which meet the current stringent Italian seismic regulations. You can get a a 3-4G signal from upstairs rooms. upstairs, a door leads to the balcony. Farmhouse style and fully equipped kitchen. Dining table within kitchen. Alternative dining areas outside, under tree canopy overlooking the pool, or on balcony with splendid views of Abruzzo countryside. There is also an I-pod/I-phone speaker dock so you can charge your phone and play music. A number of DVDs. A varied selection of books in English. A variety of blow-up toys for the pool. large balcony with views towards Lake Bomba. Table with seating for 6 on terrace, partly shaded by mulberry trees. 4 sunbeds around the pool. As bedrooms are upstairs, the accommodation would not suit anyone unable to climb stairs. We had a lovely time in Roccascalegna staying at the villa. It is exactly like the photos; surrounded by an olive grove on the way up a hill to the village. The house itself is lovely and cool with lots of fans. A great balcony upstairs with amazing views. The pool is nice but unfortunately we weren't able to use it for some of our stay through nobodies fault but a natural occurrence. You do need a car to explore the area properly and to get to shops and restaurants if you have kids like ours! The village has a lovely bakery and friendly bar owner. Nearby lots to do and see, with our kids we visited the beaches and Aqualand and attempted the Gorge walk. They liked all the lizards and the wild boar family that was spotted in the evenings. A great part of Italy to visit. We enjoyed a very relaxing week at Casolare della Quercia this August. The villa is presented to a very high standard, is very well equipped and has a lovely swimming pool. There are stunning views from the upstairs balcony of the beautiful surrounding countryside, including Lake Bomba. The villa is secluded and peaceful but is only a kilometre up the hill to the fascinating old village of Roccascalegna and its castle. We would love to go back and the enjoy the tranquility and comfort of the villa and explore the local area further. The listing description was accurate and the property clean and well maintained. We (2 adults and a 5 year old) spend to weeks at Casolare della Quercia. The house is private, a perfect place to get relaxed, and the surroundings very unspoiled. Very tasting figs! We especially enjoyed the balcony with the view (we felt a little too near the trees on the downstairs terrasse. We would have loved a terrasse on the backside of the house - with a view). For a daytrip we can recommend a trip to the Grotte del Cavallone. We would like to come back some day! What can I say... Our stay at the farmhouse in Roccascalegna was just perfect!! We stayed one week in September 2013, being two couples. The house is clean, spacious and well equipped. After having stocked up in the supermarket, we felt like there was no reason to leave the house :) We enjoyed the September sun by the pool and made good use of the barbecue. The greeting at the house was warm and welcoming, the contact with Barbara was quick and efficient. We would recommend this house to all of our friends. Best regards from Frankfurt / Germany. Casolare della Quercia is on the outskirts of Roccascalegna, a large village famous for one of the most spectacular castles in Abruzzo. The mountains provide a breathtaking backdrop to the village. There are several local shops, café/bars, and a number of good restaurants and agriturismi in the area, offering local food and wine at reasonable prices. Beaches within easy reach are good for swimming, safe for children. At Fossacessia you can see the famous trabocchi, traditional stilt-constructions suspended above the sea for fishing. The hills and small villages around Lake Bomba are well worth exploring, and there are many vantage points which afford stunning views of the lake. A short drive away is Cascate del Verde, the second highest waterfall in Italy. Historic towns such as Guardiagrele and Sulmona are within easy reach, through areas of outstanding natural beauty. In the summer, there are many traditional festivals, often involving local Italian food and live music. Full terms and conditions will be sent to you with a booking form. Client details need to be provided, and the completed form signed and returned to us in order for booking to be secured. House is cleaned once a week. Additional cleaning/extra towels and linen can be arranged for an additional fee. Please bring your own towels for the pool and beach.